I listened to a recent news story about coyotes. The news spot reported that a woman “believed” her cat was taken by a coyote. That a coyote actually took the cat was not observed, but since there are coyotes in the area, the coyotes were blamed. The track record for the news media concerning coyotes seems to follow this general pattern. When coyotes are reported by the media, the stories are sensationalist and fear-provoking. Just by being around, with no evidence to prove it, coyotes are often blamed for problems that they have never been connected to. But the news doesn’t let the facts interfere with what they consider a good story. People against the coyotes are driven by rumors and fears: they latch onto whatever feeds their point of view. This entire TV news spot was created based on this approach. The basis of the story was what a woman “believed”, and this was based on her personal preconceived prejudices. And the news report was full of inaccuracies. Foremost, the story exploded the number of coyotes from three to seven. Since two howling coyotes can sound like many more, this is what fed the new rumor. An excited, but irresponsible observer announced that she “could distinguish seven voices.” The rumor spread and was irresponsibly reported on this news station without checking this out. Then by questioning the “safety of our children” the news station fanned additional fears about coyotes. The fact is, coyotes have never approached people in our parks. Before running off, a coyote might stand in a path to see what is going on, but that is as close as a coyote has ever allowed a person to come to it. Actual parents, those who have children, have not joined the hysteria against the resident coyotes. The one human activity that could lead to aggression is feeding, but everyone knows this and everyone makes an effort to strictly keep this from happening. To get a more realistic view of how most walkers perceive coyotes, try canvasing for opinions. Almost everyone is thrilled with the coyotes and considers it a real treasure to have them in our parks. Everyone knows that if you leave the coyotes alone, they will leave you alone. The few perceived coyote problems have actually been created by one small group of dog owners who do not wish to leash their dogs and whose dogs have gone after the coyotes. Allow your dog to chase a coyote, especially if it is a parent coyote and pack leader, and it may return to defend itself. Not only will it do so at the time of being chased, but it will remember the specific dog involved for a long time to come, and it will be ready to make its own “statement” whenever it happens to see this dog for the next little while. Coyotes do not want to be chased. Fortunately our Department of Animal Care and Control allows coyotes to defend themselves from such aggressions — even if the “aggression” was intended as fun and games by the dog. Please take a look at some of the behavior postings in this blog: they are almost all supported by photographs. Coyotes are not malicious: if they were to be put in trial, and all evidence listened to, they would come out way ahead in people’s minds. But with coyotes, there never is a trial, only a final firing squad. Please get to know them: they are amazingly intelligent, warm and fair-minded themselves. One reason a news station might proceed with this kind of a story is that the media very often relies on sensationalist material — that is what sells: who is going to watch your program if everything is fine at the OK Corral? But this is irresponsible journalism: facts must be checked out, views should be balanced and a story should not be based on one woman’s personal “belief”. Let’s give equal time to how the rest of us see coyotes and their behavior, and to the experiences we have had when we come across one. I’ve read where newspapers are “not here to report the news, but to form the public’s opinion, very often with misinformation.” The problem is that inciting fear and hysteria is not helping anyone except the newspaper itself. When your leg can’t get to the itch, you get up and use a natural “back scratcher”. This is the second time I have seen a coyote make use of the available flora for taking care of its itching needs. I know that in dogs, leg-lifting is a fairly macho thing and a sign of coming of age. This is a recent development for a couple of male coyote pups I have been observing. These pups were born in the Springtime of 2009, so they are about 16 months old. I don’t know if this is the time frame for dogs, but it is what I have observed in two young male coyotes. Before this recent development, all four legs were firmly planted on the ground, with a minimal “squat” in the back legs. Females normally squat low to urinate or mark. However, even females sometimes lift a leg, but it is done a little differently than the male: see last photo in posting “Mom by Charles Wood” on August 1, 2010. The female will swing the leg more forward and will retain a squatted position vs. the male whose leg goes out to the side. 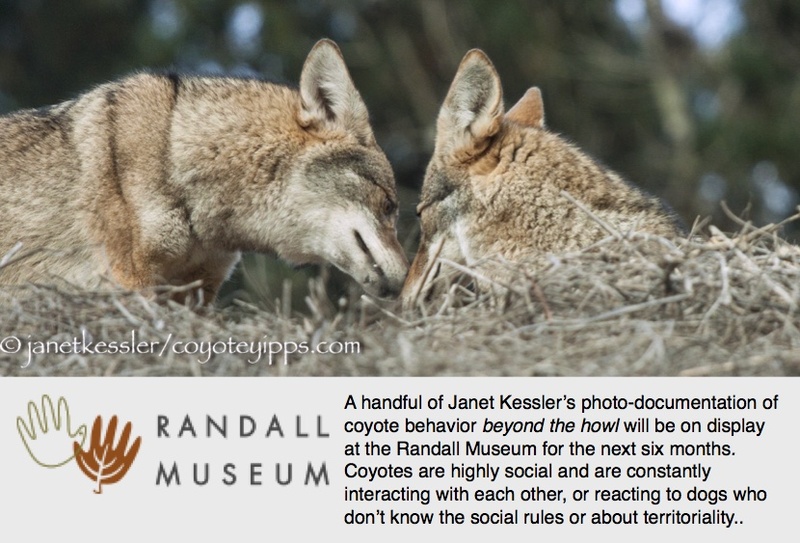 Greetings always occur when coyotes from the same family come together, even after only a short time of separation — say, less than an hour!! Today, there were these normal greetings, and then this group sat on the path, as if allowing me time to look at them. I was impressed with the sniffing today — there is always something that stands out when I observe coyotes. On this day, I caught the mother sniffing at the young male’s genital area. I have seen this behavior a number of times recently. I wonder what it means? The young males are about a year and a half old, and this may be a time when sexual maturity is setting in and possibly causing some changes in hormones and oder? The coyotes soon got up and moved on. Sniffing of another sort continued when the group reached a spot much further down the path. I knew what this was about because only five days before, I had seen a raccoon right in this spot — one of the few spots where its passageway was visible. It must have been hurrying home after a night checking out the garbage cans on the streets! I knew the coyotes were onto the same scent. After “getting” what the scent was, they ran over to what they (and I) knew to be another section of the raccoon path. After having collected the information, scent, they needed, they ran down to a thicket area where I could no longer see them. Soon, I was proven correct. Although, because of the density of the grown, I could not see anything, I could hear the hissing and growling of the raccoon. This didn’t go on for too long before I again saw a coyote resting on a hilltop. The coyote would not have been there had there been a successful capturing of a raccoon. So, more than anything else, there was drama this morning. Raccoons are very good fighters: fierce and strong. And raccoons can climb trees beyond 75 feet, whereas a coyote is limited in its ability to climb perpendicularly! An incident which caught my attention was when a dog came into an area where three coyotes had been hunting. The mother coyote slowly approached the dog in her usual “halloween cat” stance warning pose, while the younger ones for the most part ignored the dog in the distance. However, as the mother continued her warning stance, and continued her darting towards and then back from the dog, the two younger coyotes joined her in approaching the dog: one did so distantly, but the other actually seemed to imitate the mother a little bit. Once again the alpha male, Dad, stopped my attempts to find his family. As my dog Holtz and I walked on a dirt road in his field, Dad stepped out from the brush in front of us onto the road. Holtz immediately started to chase Dad and I stopped him with his leash. Dad bounded away from us down the road, but kept his head turned behind him and saw me restrain Holtz. He stopped and quickly returned to begin his display. Dad defecated and scraped dirt. That was followed by an approach, head down with an intense unblinking glare directed towards Holtz. A dog will similarly approach another dog in play, where tension is created between the two as the distance is closed. The approached dog sallies and a play fight results. Instead, with Dad and a restrained dog, the approach stopped, followed by to-and-fro struts. The strutting was followed by yawns and stretches, a trot away and a return moments later. It does seem that Dad had expected Holtz to sally and fight. It does seem that Dad will prevent me from observing his family.